Renting can make you feel like your in a transitional period and hinder you from decorating your home because you don't own it. I say go for it. Make your current space as cool and you would if you owned it. Add artwork to the walls and create your own style. 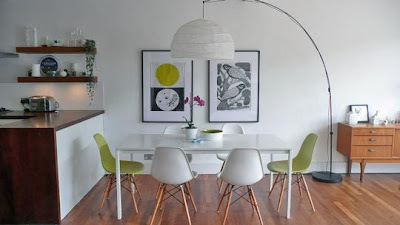 Typically in rentals you can't change out an outdated light fixture or other major element. Instead, why not bring in items that can create a stylish and functional space without having to be "installed". This brings me to my first idea. If you are dying to get rid of an old and dingy light fixture or chandelier, consider a large lamp in place of a light fixture to use over a dining table or living space. They can create a bold and dramatic statement without you having to bust out any tools. When the walls are all white, think of your rental as an open palette to use to hang brightly- colore d artwork or photographs. Large lithographs and black and white photographs look magnificent against a bare white wall. Bring in home furnishing that have texture and pattern to contrast with your white walls. If your dying to paint, try adding a thin stripe of color along an open staircase. Bungalows are cute and cozy, what more do you need? Bungalows are pieces of history, reflecting the needed space at the time, which rarely exceeded over 1000 sq. ft. Today's floor plan laughs at the small and boxy floor plans of an older home. The large garages of today resemble a monster's mouth and would eat a bungalow for breakfast. So, why would anyone want to buy a cute and cozy bungalow when there are SO many huge homes out there, many cheaper, they could afford? The character that permeates an older home cannot be found today. Bungalows not only have character but the floor plan makes sense and can sometimes reduce your heating bills. Small rooms with the right furniture and layout are utilized to their full potential while visually creating a happy and vibrant space. Sturdy and durable hardwood floors throughout the home are beautiful. With a little sanding and staining they can be brought back to life. Architectural details like old glass windows or built-in cabinets are details that become part of you home, and give it a unique quality that can be hard to recreate. Bungalows come in a wide array of styles and colors, making each one really unique. Most have small porches perfect for a set of outdoor dining chairs or porch swing. The open front windows of a bungalow flood the front room with light, creating an open and airy spot. 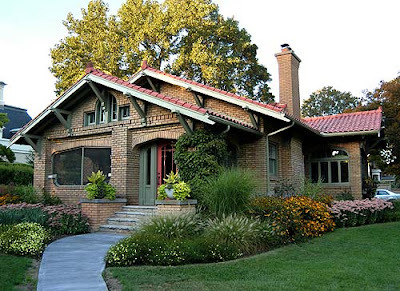 Bungalows can be hard to find and some will require TLC and possibly a big restoration but in the end, you bring back to life a unique part of history and architecture that will someday be lost among the developments and strip malls. More importantly, you might realize that you don't need a lot of space to be happy.